This year I was blessed to team up with Haiti Awake and travel to Haiti with their 1st official mission team! The opportunities they are giving the Haitian people are incredible! I can not wait to minister alongside them again. Thank you, Haiti Awake, for such a life-changing experience and allowing me to make lifelong friendships. It is our great joy and privilege to be in relationship with one of the local prisons. Having spent time visiting over the last two years, Haiti Awake is now recognized by prison officials and allowed to come to minister regularly. We are thankful for the opportunity to share God's love in a place that is often forgotten and inaccessible. In His providence, the children came solely under our care in January of 2017. We continue to pray Luke 2:52 over their lives, trusting that God has heal their broken places and allow them to thrive spiritually, emotionally, socially, and physically. Bible schools can be large - at an orphanage or a church or a school. Or Bible schools can be small - in our home or the children's home. Mission teams are a big part of our Bible school program. Several organizations have invited us to do Bible schools at their schools, churches, and orphanages. We are excited about visiting different locations and sharing the truth of God's Word with young hearts and minds as we continue to build relationships. Bible school is an essential outreach in our own community. 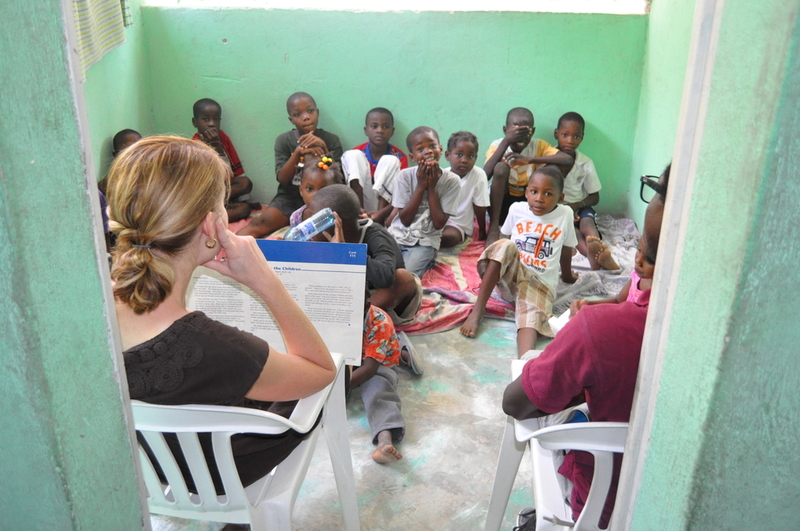 Teams conduct VBS-style outreaches in a number of places. We believe Americans should leave Haiti with a new understanding of her rich history, her unique culture, and the natural beauty that is to be found just a short distance outside of Port au Prince. Therefore, we plan specific activities so that teams not only see our corner of Port au Prince, but they see some of the other amazing areas of Haiti. Further, each team participates in Creole lessons, cooking lessons, and other practical culture-based activities.